From the beginning (the beginning of my grief, that is) I’ve talked about various aspects of grief, even the parts I thought made me look weak. Today’s topic — grief bursts — is one I was going to keep to myself, but it’s an important one so I’m going to risk seeming weak once more. I’ve often said that the trouble with grief is that it doesn’t stay gone. You think you’re doing well, settling into your new life, accepting your situation, and then zap! It hits you, generally when you’re least expecting it. One of the worst of these zaps occurred after my life mate had been dead for five months. I dreamed that he died, and in the dream I woke to discover that he was alive and getting better. I could feel the tension of grief draining out of me, and it felt good to just be . . . me. I awoke for real with a smile on my face, glad he was still alive, and then I was sucker punched by the truth. I felt the way I did the first time I realized he was dead, and it set off an upsurge of grief that lasted several months. Then last spring, at about the fourteen month mark, I was walking, collected and serene, down a suburban street carved out of the desert, and I was blindsided by lilacs. 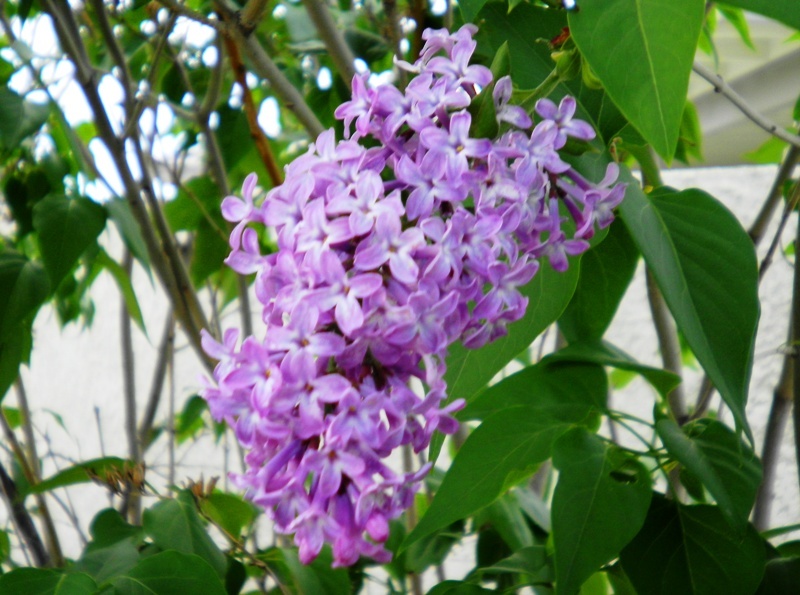 He loved lilacs, and we’d planted lilacs all around our property. The year before he died, the plants were tall enough to create an oasis of privacy, and when they bloomed, we’d go outside and bask in the heavenly scent. When I came to the desert, I never expected to encounter lilacs, but there they were, growing wildly in a vacant lot. That familiar scent, coming toward me when I was unsteeled against a grief upsurge, did me in for a couple of weeks. Mostly now, I’ve settled into uncoupled life. I miss him, of course, and yearn desperately at times to talk with him, but I’ve accepted as well as is possible that I have to continue on with my life. I feel like myself again (meaning I don’t feel weighted down with grief all the time, nor do I hold myself tensed against possible upsurges of pain). What I do experience are grief bursts — brief bursts of grief, with all the angst I felt at the beginning, that last but a minute or two. These bursts come a couple of times a day, generally after I’ve been concentrating on a project (such as writing a blog or reading a book), and in the moment when my mind is not otherwise engaged, I remember that he’s dead, and grief bursts over me. I cry for a minute or two as if my heart will break (though I know it won’t. It’s already been shattered and glued back together, stronger than before). And then I’m fine again with no lingering aftereffects. Of all the strange stages of grief I’ve experienced, these grief bursts are the strangest. Like being skewered with a burning poker and then healed a second later. This particular stage, or so I’ve been told, can last a long time. Even decades after a significant death, you can experience bursts of grief. I’m sure, like all the other phases of grief I’ve gone through, these bursts will diminish in frequency, perhaps even diminish in intensity, but oddly, this is one stage of grief I don’t mind. It reminds me that he was worth grieving for, that his absence from this world matters, that he once was part of my life. Nothing about healthy grief makes a person sound “weak.” I’ve seen some who had no desire to rise above the grief. My mom was like that, as I’ve mentioned before. She didn’t even try to fight it. She did more than grieve, Pat. She wallowed in it night and day for ten years and totally left planet earth, but what I hear you saying is to “process it,” and that’s healthy thinking. You have the ability to analyze what you’re going through whereas some folks just totally cave in without so much as a fight. I hear you saying the word “dead,” which I think is a healthy and realistic word that perhaps yields more pain than other terms. I’m listening to you and trying to learn how to travel that road if and when my time comes. Thanks for being a great teacher. Maybe we met at this time for a reason, such as to give you a different model for grief. Supposedly we grieve the way we were taught, but I sure hope if you are in this situation, you will grieve, process it, and learn to live again. As for “dead” — I hate the euphemisms. “Passed” is the worst. Thanks to you, I do have a different model for grief now. To everyone who reads this – I heard something on TV many years ago that helped me so much. Buy a special candle that represents your loved one. Either hang it on the wall in its own special holder or buy a special ring to go around it. Light it when you get especially lonely and just watch the flames dance. I can’t explain it, but it helps. It turns a thought into some kind of physical evidence of that thought. Light it for every holiday as well. It isn’t a religious symbol, necessarily, it’s just a way to make an intangible thought into something you can see. God bless. I unconsciously kept my mind busy throughout all the phases. I’m where you are at the moment. My way of getting thru was reading. When I was reading, I couldn’t think and couldn’t feel bad. I still read a lot now, but I find I don’t need to like I did in the beginning. Plus I have other things to deal with now. My dreams were all bad. Every night I had a different one, and in each Jake was leaving. I don’t know how many different ways my brain came up with for him to leave, but every morning I woke up feeling devastated. Thankfully those dreams have stopped. But I still miss him every moment of every day, and I get blindsided too, on a regular basis. Holly, it’s so hard dealing with this. I’m glad we met — being able to exchange stories makes grief seem less isolating. The only recurring dream I had was searching for him. Every time I remembered a dream, that’s what I was doing. Just searching. No big stretch of the imagination where that dream came from! Me too! Especially since we are so close together in timing. It sure does help me understand what is going on. Friends and family seem to think I am over it, never ask how I am doing, never talk about Jake. It is like he didn’t exist. Every day I face new challenges without him, and I am so very aware that I am without him. I am far from over it, but I keep it to myself now. Talking about the dead is a good thing, but only if you talk about the positive aspects. It’s easy to remember the negative things and develop anger or even bitterness that will only grow if you keep nourishing it. Especially talk about the funny things he did.Others may not open that discussion because they don’t want to make you grieve, but that doesn’t mean they aren’t thinking of him or that they aren’t hurting, too. It’s out of respect for you. Bring the subject up and talk it out for a while without letting it dominate the overall conversation. Blessings on you, Holly. I’ll pray for you, hon. See, that’s where our experiences differ. To me, it’s important to remember the negative aspects as well as the postive. He and I got along very well, but there were a few problems, and I had some lingering issues to deal with after he died. I couldn’t pretend everything was always great, because it wasn’t. I want to remember him as he was, not as an idealized version of him. Of course, you’re right about not nourishing the negatives. Like all else dealing with grief, you have to feel the negatives, process them, and eventually let them go. Yes, exactly. I don’t dwell on the bad parts, just don’t block them out. Sometimes the negativity drives the grief. I knew one woman who grieved for her mother for two years, not out of love, but out of anger at what she should have received from her but never did. She finally worked through her anger and her grief. When anger drives grief, it takes much longer to recuperate. Maybe that was my mom’s trouble She had good reason to be angry and it drove her down so far that no one could reach her. Not even God. She shut everyone out. I find it strange that she didn’t get sick during that time as mental attitude sometimes opens the door for illness. You’re right, it is amazing. People who are grieving the death of a spouse have a 25% higher death rate than the rest of the population. That’s just death — the rate for illness is exceptionally high. Grief depresses the immune system. Grief hits whenever it wants to. It has its own timetable. Sometimes I know why – like this week when I was going through the garage and letting go of some of John’s tools. Other times it just hits me in the pit of my stomach when I realize yet again that he is not here. And I do think the 18 month mark is an anniversary. Mine is coming up next week and I am already reacting to it. Sadly, it is on Thanksgiving Day, a day I don’t want to celebrate – again – without him but there is nothing I can do about it. And yes, our loved ones are definitely worth grieving for. Joy, it’s odd how we have to keep realizing they are gone. I’m not sure our brains are equipped to handle the concept of death, so every time I realize he’s gone, my brain sends out a spurt of grief because it has no other way of handling the conundrum. I’ll be thinking of you this Thanksgiving and wishing you well. It is not weak to grieve. It is not weak to cry, to sob, to cry out in the wilderness. This dialogue we have in our heads about what is strength and what is weakness is codswallop. “The only way to get through a grief upsurge is to feel it, process it, and when it begins to abate, let go” This line of yours Pat says it all and this is strength, this is courage. That’s why your writings are so important. Some can’t find that courage so they take refuge in all sorts of avoidance, in anger or victim mentality or whatever. Personally I don’t see this as weak either…just needing a different kind of help…which is sometimes available to them and sometimes not. Thank you, Leesa, for your wisdom. You always say the right things. Mostly, I don’t feel weak when I am by myself, nor did I feel weak at the beginning of my writings about grief, but sometimes now I hesitate about posting, worrying that those who have never been through this will think I’m weak or that they will think I’m being self-indulgent. But I keep writing, because the truth is more important than what anyone thinks. And anyway, everyone has been kind. Thank you Pat for your wonderful words. You’ve described perfectly how I’ve felt these past 9 1/2 months since my father’s death. It’s by far the hardest thing I have gone through in my 29 years and makes me really sad of the approaching holidays as well as the 1st Anniversary of our last phone conversation (my birthday) and of his death. The one thing I have allowed myself to grieve, cry, sob, laugh, reminisce and remember my dear old dad. I thought I was doing so much better and then wham it hit me like a ton of bricks. My fiancé suggested before Thanksgiving dinner we should go hiking at Sweetwater Creek State Park, where we scattered the last of daddy’s ashes and where I haven’t been since. Hope I feel a lot better again soon. You will feel better again soon, I promise, but there will come other times when you feel worse — times that your father should have been there to share — but you will get through those times, too. Eventually, the grief bursts won’t come as often or hit you so hard, but you will probably always miss him. You’re very wise to have allowed yourself to grieve, cry, sob, laugh, reminisce. It’s how we eventually get through this to a more peaceful time.